So first things first the prep was a huge success, every new thing I tried worked fantastic and I am already implementing things with current clients. I would never normally advise any one to just prep for 10 weeks but due to holidays and weddings I really had no choice. Fact is going in hard from the start didn’t affect my physique in any negative way and I actually grew through this prep which I believe is down to my new 4’s Training Programme that I will be doing a separate post on and will likely be available for sale on the site soon. Keeping consumption of junk food and processed food to basically 0 allows you to get in shape faster (while still utilising very high carb days) and also seems to allow for more abdominal/viscal fat to be burnt as my waste came in smaller than ever. Keeping estro lower through proper supplementation use for the duration allows one to get lean quicker. There is no Need to overdo an Ai leading into the show. Proper adjustments to training volume and programing as you come into the show can have a huge impact on the muscle you keep and the look your physique keeps. Only 1 I can think of and it’s a major one is that for myself personally I can’t much show day due to my GIT issues so I need to make sure I wake full to the brim and dry which as you can see from the pics below I did. 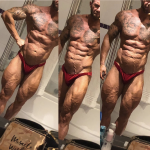 However the mistake I made is taking a little diuretic show day and I mean little but this flushed to much water out and as I am unable to eat to balance this out results in me looking flatter on stage. For anyone else this way forward works great as allows you to eat and add water and fill/dry at the same time but for me I just got flat and then when I put some sushi in I managed to start filling up but then was a little distended. Main signs of this flatness is in my abs from the morning shots to stage shots and my glutes. 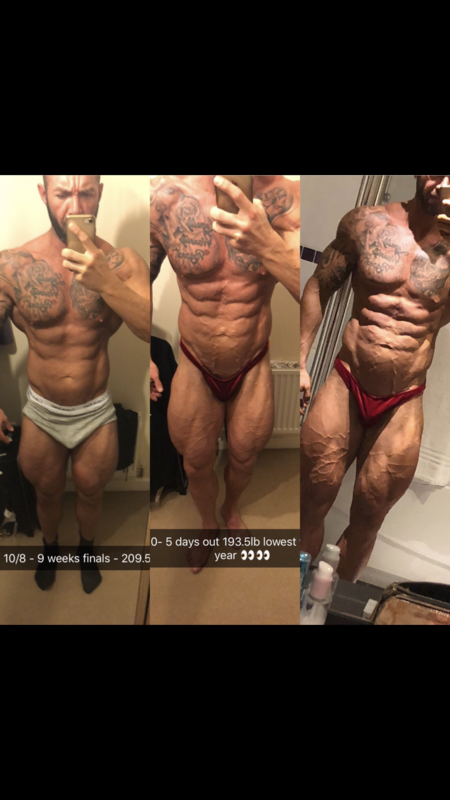 So as you can see from the below pictures huge changes in 10 weeks, much improved on my last outing and my new training methodology is yielding fantastic results with both myself and clients. So keep a close eye out on my Instagram and this Blog section as I am pushing the limits like never before in terms of training, overall dedication, nutrition and supplements. This is the most focused I have ever been on improving my own physique and is the first time ive had an off season in over 5 years. Big things to come…………….. Attached are pictures from the morning of the show and also the full layout of my Peak week is below which is very rare for people to post and lay it all out. Obviously the supplement as been removed. duiretic Dependant on morning weight protein, very low to 0 carbs and higher fats from oils today. duretic if needed – used and shouldnt have Very little show day maybe just ground rice meal 1 and a little fish. pre stage rice crispy bar or 2.